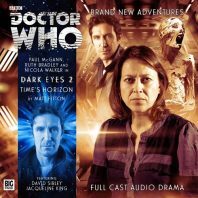 Compared to the single-stream narrative that filled the original Dark Eyes, the sequel set has proven willing to take a more eclectic approach with its storytelling format, beginning with a classic Dalek tale in every regard to set up the mystery behind the Doctor’s shocking betrayal and then switching to a more modern Earth-based tale with the Viyrans to reunite the Doctor with Molly O’Sullivan. Going farther afield than ever before in Matt Fitton’s ‘Time’s Horizon,’ the two find themselves at the very edge of creation upon the spaceship Orpheus as an ancient force appears to be heading back into the known universe from the end of time. Surprisingly, the Doctor crosses paths with Liv Chenka for a third time in the most unexpected of locations, but it quickly becomes apparent that the Doctor’s actions in ‘The Traitor’ are in Liv’s past but still in the Doctor’s future, with Liv inadvertently cementing the course of action that the Doctor must take by making mention of what she witnessed and then had to survive in the aftermath. Fortunately, Molly is there to temper Liv’s rightful anger by defending the man she has come to know and to trust so implicitly, insisting that there must be something that Liv does not know about to explain what occurred from her perspective. It’s not often that the Doctor acts and doesn’t inspire confidence in those immediately around him, and the layered interplay between the three leads that encapsulates such a range of emotions as a result is exceedingly well-performed and poignant. With the Daleks eliminating the alien force that the Doctor wanted gone in ‘The Traitor,’ the story of Liv’s survival and escape excitingly goes in a different direction than expected to step away from the Doctor’s greatest foes and to insert a new level of scope and scale to affairs. Aboard this long-range explorer ship intended to be a one-way mission to chart what is out in the extreme depths of space millions of light years from home with its crew frozen and backed up on a computer system, nobody expected to witness what befalls them when space seems to end and the gaseous form of the Eminence draws near. The Eminence first appeared in 2013’s ‘The Seeds of War’ and made an instant impact as a deadly foe with its ability to control the minds of those it comes into contact with as they inhale its breath of forever and turn into corpse-like Infinite Warriors that are nearly impossible to kill, and though it is not yet explained how it came to be at the edge of the universe as it crosses paths with the Doctor for the first time from its perspective, this foe certainly reaffirms just how dangerous it is as it comes to recognise its own essence trapped from so long ago inside the Doctor’s mind. Yet as a corpse is duly reanimated and the Eminence war against humanity comes into focus once more, Fitton wisely brings a much less grandiose threat into prominence as well. With this unexpected finding seemingly representing an infinite source of energy, those living in a time of energy crisis when the ship’s logs are eventually received some three centuries later naturally take an interest, but it’s Randall Veran who hopped through time onto the ship a year after its departure and has since been waking up every fifty years inside of Liv’s body to lay a trail and to help extract some of the energy encountered. As this character ultimately becomes the most desperate to survive when the truth is revealed and another’s assumed cowardice turns into true bravery, this segment is one full of surprises and helps to set up the Eminence as a recurring threat in addition to the Daleks for the ongoing instalments of the Dark Eyes saga. With incredible direction and well-rounded characterisation to complement the usual strong lead performances, ‘Time’s Horizon’ expertly shows an isolated base under siege in what works very well as a standalone affair that will also tie into future events with the Eminence returned and the Master surprisingly making a cameo and rescuing Sally Armstrong who so unceremoniously met her demise in the original Dark Eyes.